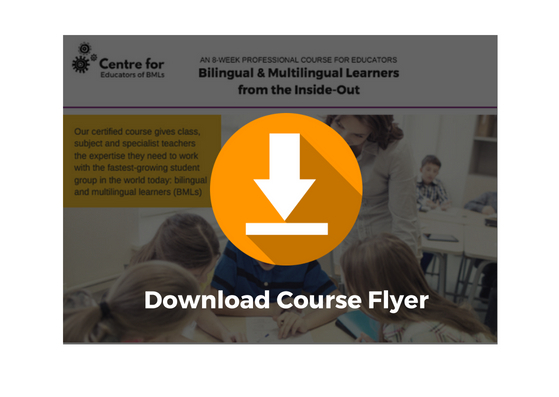 for educators of bilingual and multilingual learners. This 8-week, online course provides an intriguing journey into the research, best practises and experiences of BMLs as they learn in English-speaking schools. This course has helped educators transform their teaching to create positive impact in the lives of their BMLs. We know that working in a 21st century classroom is demanding and requires you to meet the needs of a diverse group of learners. BMLs are now the fastest-growing student population and all teachers need to be equipped with the knowledge, skills and expertise to help them succeed in school. This 8-week course not only provides you with the ‘theory,’ it up-skills you with the best practices, research and strategies that you need to help your BMLs thrive in school. Week-to-week, you’ll be able to start applying your new learning right away, enabling you to enhance your expertise and teaching practices. Teachers who’ve already taken this course have called it, “transformative,” “practical,” “fascinating” and even “essential.” There’s no doubt that this innovative blended learning course gives participants an edge in understanding their learning content through the practical lens of the students in their schools and classrooms. Each week, participants uncover new learning and apply it meaningfully to a case study student in their school. As they progress through the course, they fine-tune both their understandings and their practices. Whether you’re an experienced teacher or just starting out, you’ll get a lot out of this course. It’s designed to suit every teacher in a K-13 (primary & secondary) school regardless of whether you’re a classroom or subject teacher. You’ll learn how to work smarter with your BMLs so that you can maximise the strategies that will help them make ongoing progress. We know that empowering teachers with the right training translates to positive impact in the lives of students. That’s why we’ve created this 8-week, certified Educator’s Course, Bilingual & Multilingual Learners from the Inside-Out. It is designed to be informative, interesting and practical. If you’d like to register a group of teachers or a whole school (up to 120 staff), contact us using our Contact Form and we’ll send you all the information you need to register your group. Better understand the needs of diverse BMLs: those with special needs, refugees, etc.